DocHire is here to offer physicians and allied healthcare professionals a simple job search solution. Making this process as easy as possible is our goal. As a registered physician on DocHire you may search for and apply for healthcare opportunities in every specialty in any desired location both permanently or for locum tenens. You can search the jobs at your leisure, and update your CV easily when there is a change or update. Register now, post your CV and open the gates for job opportunities to come flooding in. 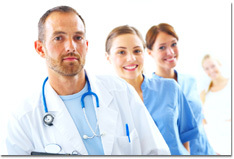 Employers benefit from the plethora of physicians searching the site daily. DocHire can give you a user friendly format to post your jobs as well as share information about your community. Our specifically designed search filters help you to find the right person or the right job easily. DocHire is here to make the process of recruitment highly cost-effective and hassle-free. Search the DocHire Database of physicians by state or by specialty and reach out to candidates that are actively looking. Register now and start posting your positions. Whether you are a professional or an employer, DocHire offers the most effective platform. No need to search numerous sites for the right job or the right physician. Your job search ends here at DocHire.